First, the quarterbacks. Tom Brady was sharp, going 20-for-24, and he connected with Brandin Cooks for three straight passes--including a 30-yard TD that WEEI's Ryan Hannable called "the highlight of the day." Jimmy Garoppolo was solid, but threw back-to-back picks in 7-on-7s. Per Doug Kyed, he finished 12-for-18 with a 6-for-8 mark in 11-on-11s, and Jacoby Brissett completed 17 of 31 with an interception (9-of-15 in 11-on-11s). First practice is in the books. Brady was 20 of 24 and completed his last 14 passes. Hit Brandin Cooks three straight times in final period. The secondary was generally strong, though Cyrus Jones continued to struggle. He opened up camp with a fumbled return, and was burned by Brandin Cooks on the goal line. With so many contributors at cornerback, Jones may already be on the outside looking in. On the other hand, Malcolm Butler and Stephon Gilmore blanketed their men all day, and undrafted rookie Kenny Moore followed up a strong minicamp with an impressive start to camp. He took some starting reps in the slot (splitting time with Jonathan Jones) and finished with a pick and four total breakups. Kyed noted that "he was impressive during minicamp, but this was his best practice in a Patriots uniform." Malcolm Butler was the best defensive player on the field. Only allowed one catch in team drills, a short, contested pass to Edelman. Kenny Moore had a great day. He intercepted Brissett in 4v4s and finished with four deflections total. Impressive. The pass-catchers had some highlights and lowlights. Aside from the aforementioned Cooks heroics, UDFA Austin Carr made a great toe-tapping snag in the back of the end zone. Rob Gronkowski also turned in an outstanding performance and was a full participant in practice for the first time in what feels like forever. But on the other hand, Malcolm Mitchell looked a little rusty after not practicing during minicamp. For a guy hoping to build on a very strong rookie season, Thursday's debut was a little bit flat. Rob Gronkowski certainly looked fully healthy today. He was stunting for the crowd after each catch. 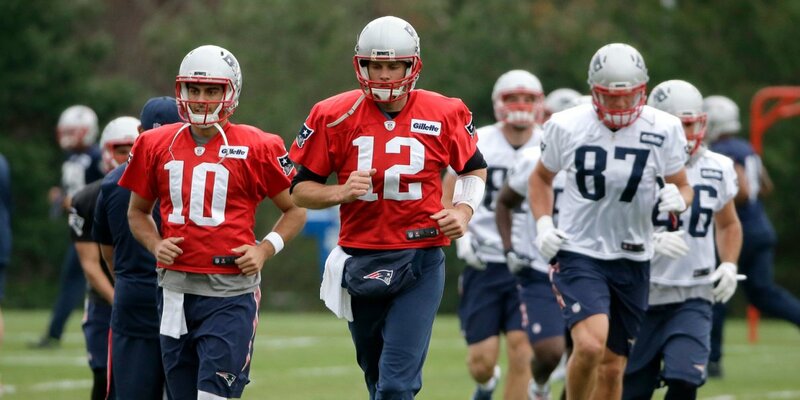 It wasn't all perfect, but overall the first day of Pats training camp was a successful one. As more players get on the field and the team continues to jell, New England will be a force to be reckoned with.